While shopping for rice - I spotted this recipe on the back of a Success Rice box. 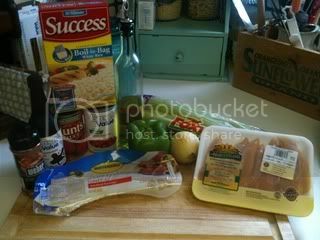 I usually choose brown rice - this recipe/a free product coupon/and the fact that there was no Success brown rice on the shelf - were enough for me to make the purchase. This was also my first time trying turkey smoked sausage - I couldn't tell the difference. 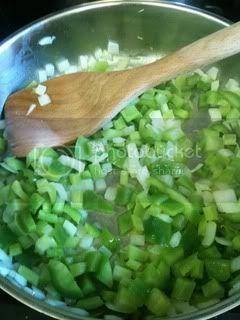 Saute onion, bell pepper and celery for about 5 minutes. 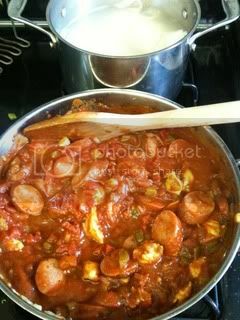 Stir in smoked sausage and chicken - cook for another 3 minutes. Be Prepared Here: Throw on an apron and wield your glass lid shield - those tomatoes mean business! They are out to get on your counter-top, clothes and floor if you let them! Everything from the can that wouldn't open and then went flying all over my face and glasses - to the sauce that just jumped right out of the pan and onto my floor - it was enough to having me running for an apron. 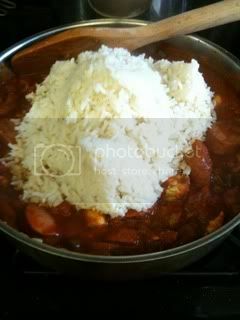 VERY CAREFULLY - I used tongs - pour rice out of boil in bags and into skillet. 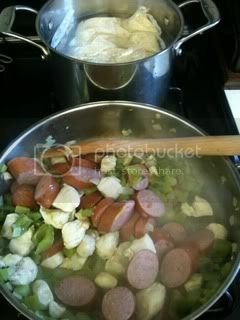 This recipe was supposed to feed 4 - and since I have 6 in my family - I through in an extra bag of rice, stalk of celery and another 1/2 of smoked sausage. 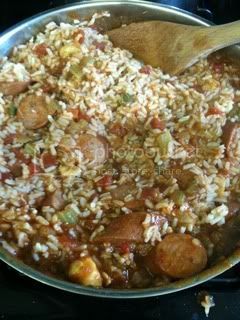 This was a pretty spicy dish - Glad that I resisted the temptation to add more creole seasoning since I was adding more rice and sausage. 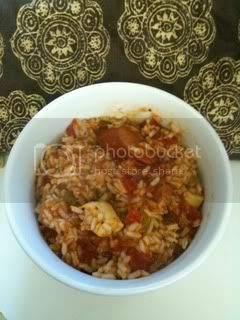 Over all I give this dish 4 spoons - it was yummy and useful! It was pretty awesome that while the rice was boiling away - I was able to get everything ready in the skillet - when I was done - so was the rice! Want to try Success Rice for free too? I am giving away 5 free product coupons HERE!